If you can believe it, it has been nearly two years since Beyoncé gave her fans a heart attack and changed the game with the surprise release of her visual album, Beyoncé. In that time she watched her sister and husband fight in an elevator, collaborated with Nicki Minaj, tried to convince everyone to go vegan, went on tour with her husband and let us see Blue Ivy’s face on a somewhat regular basis. While that was all good and fun, it’s time for Beyoncé to get back to business. You can feel it in the air—we’re all ready for something new. We’re ready for more choreography recreate poorly in our bathrooms and for another catchphrase now that “I woke up like dis” has been beaten into the ground. Although we don’t have any official announcements yet, there is much evidence to suggest that Beyoncé will both destroy and and uplift our lives sometime (sort of) soon. In 2013, the year Beyoncé “pulled a Beyoncé,” she appeared on the covers of Vogue, GQ and other major magazines with seemingly nothing to promote. Obviously, on December 13th, we figured out what she had been promoting. She’s already appeared on the cover of this year’s Vogue September issue, and today Flaunt magazine released their latest issue featuring King Bey. With her Topshop line scheduled to come out later this year, it seems a bit odd that she wouldn’t hold off on big fashion spreads until closer to the launch—unless, of course, she has a project coming up. Beyoncé might also simply be trying to keep her face and name in the press because fame is fickle. Counterpoint: She’s one of the few the stars today who can reliably sell magazines so she might simply be fielding and accepting offers as they come. Further, she’s one of the most famous humans on Earth. If her profile were any higher, she’d need a spacesuit. Her activewear line with Topshop is due out this fall. In 2013, Beyoncé had a huge campaign with H&M leading up to the December release of her album. Counterpoint: Correlation does not imply causation. Beyoncé was seen all summer darting in and out of her office in New York City, often clutching her MacBook close. All signs point to something brewing at the Parkwood headquarters. Counterpoint: There are plenty of reasons why an international superstar with multiple business ventures and employees would need to visit her office space regularly. Beyoncé performed at the Made In America festival—which was founded by her husband—over this Labor Day weekend and homegirl put on a show. Many people, myself included, assumed she would do some sort of repackaging of her performances for the On the Run Tour or her 2014 Video Music Awards performance. Instead, she introduced brand new sets, dancers, costumes and a revamped setlist. Such a splashy show might have been a hint of things to come, or at least an attention grab. Counterpoint: She is a consummate professional and simply wanted to pull off something new and great for Jay Z’s festival. There have been many first hand accounts floating around all summer about Beyoncé recording new music. She’s also been seen coming in and out of recording studios around New York. There is also the maybe-fake registration of new songs with Babyface and Lil Wayne that surfaced recently. Counterpoint: She’s a singer. To a certain degree, she’s probably always recording. Also, there is no solid information about how far along she is in the recording process. She doesn’t appear to be pregnant, meaning she could roll right into a huge album drop and another major world tour without missing a beat. Counterpoint: I dunno, she might be pregnant. One of the reasons why the releases of Beyoncé was so surprising was because not only had Beyoncé been on tour for basically an entire calendar year, when she wasn’t performing, she was spotted chilling on yachts what seemed like every week. In the past year, she’s still been hanging out around the globe meaning that, who knows, maybe she’s gearing up for something big—or that she just does her best work after some beach time. Counterpoint: Beyoncé is incredibly rich and most of us would probably go on lavish vacations year-round if we were incredibly rich. It seems safe to say that the reaction to Tidal has been pretty unenthused so far. One thing that Tidal has always had going, though, is the star power behind it. It’s largely assumed that Tidal will fully flex this power eventually with an exclusive album release from one of its big artists. Obviously the exclusive rights to a new Beyoncé would be a huge boon to the streaming service. Counterpoint: Considering that Sony still owns all the streaming rights to her music, there’s no guarantee that Tidal could pull this off. 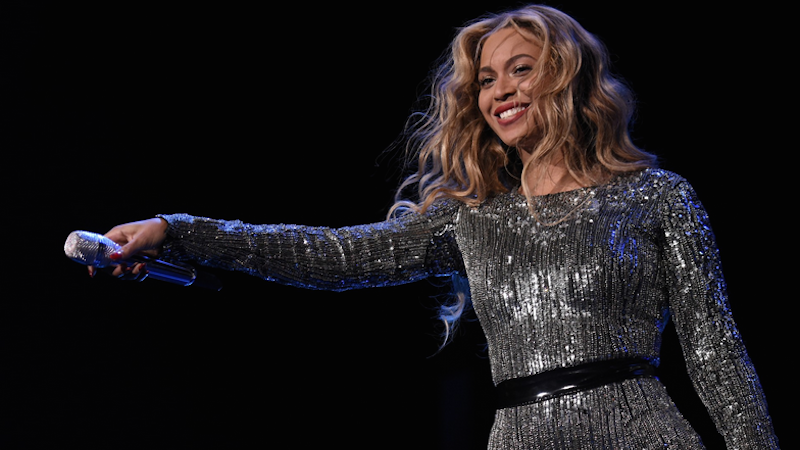 (Beyoncé’s entire catalogue is still available on Spotify.) Also, while a new Beyoncé album would be amazing, Tidal could pretty easily fill this opportunity with an exclusive drop from someone like Rihanna or Kanye West. Do you have any other clues? Is Beyoncé going to release a new album before Rihanna? Is she going to drop something completely out of nowhere again? What did Blue Ivy have for lunch today? I’m open to most (but definitely not all) suggestions. Beyoncé with laptop images via Splash News; Beyoncé vacation and candid Made in America images via Beyoncé.com; all other images via Getty. Beyoncé magazine covers courtesy Vogue and Flaunt.